In part one of this two-part blog series, we lay the groundwork for you, the dental waterline novice, to effectively treat your dental unit waterlines for the first time. Strap in and get ready, because we’re diving into strategies for implementing waterline treatment for first time users. If someone told you that shopping mall parking lots were filled with a population of opportunistic car thieves looking for any opening to steal valuables from your vehicle, you would lock your vehicle, right? Car thieves target such places because the environment is ripe with opportunities for them to exploit. Microbes and opportunistic pathogens populate a dental waterline in much the same way--looking for any opportunity or weakness to exploit. Dental unit waterlines are wonderful incubators; therefore, you will find a density of these unwanted occupiers ready to exploit any available resources or opportunity to proliferate. This concept is nothing new for many of you reading this. If it is, I would highly recommend you check out one of our first articles on the bacteria problem to better familiarize yourself with these concepts. The purpose of this post is to help the uninitiated get over the hurdle of treating for dental waterline hazards for the first time. Armed with some basic treatment and testing frameworks, these concepts are fully scalable and repeatable in any dental environment. Let’s get to it! What Type of Source Water are You Going to Use? Use water that meets the CDC recommended limit for dental procedural water (i.e., <500 CFU/mL of heterotrophic water bacteria) for routine dental treatment. Consult with the dental unit manufacturer for appropriate methods and equipment to maintain the recommended quality of dental water. Follow recommendations for monitoring water quality provided by the manufacturer of the unit or waterline treatment product. Discharge water and air for a minimum of 20–30 seconds after each patient, from any device connected to the dental water system that enters the patient’s mouth (e.g., handpieces, ultrasonic scalers, and air/water syringes). Consult with the dental unit manufacturer on the need for periodic maintenance of anti-retraction mechanisms. The big one there is the <500CFU/mL HPC purity. That’s your target. So how do you get there? Well, you need to put a good plan in place and it starts with a practice evaluation. Dental waterline treatment doesn’t happen in a vacuum. Many factors play into the efficacy of a treatment program. Your knowledge and understanding of their relevance will help you prioritize your efforts the same way you move pieces on a chess board. One of the first things you should look at in the practice evaluation is whether treatment had been part of your practice’s routine at any point in the past. Establishing a baseline from past efforts will help you capture critical information relevant to factors such as potential chemical interactions and current biofilm contamination. Regardless of the treatment product you select, you should be thinking about shocking more than once. We’ll cover shocking in more detail in the treatment methods section. 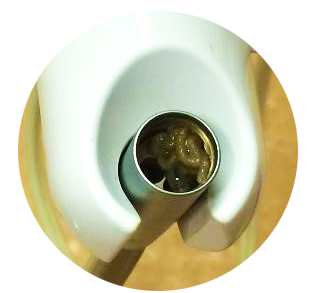 The dental unit, specifically the way water is delivered to the handpieces, has a direct effect on your ability to control coolant contamination. Developments like the independent water reservoir (aka. bottle feed) were an evolution in chair design aimed at providing dental health providers (DHPs) a conduit to control source water quality and intervene with chemical treatments for microbial contamination. If you don’t have a bottle, don’t worry. You still have options. But I recommend you consider converting your chairs to a bottle system. As you will see, bottles will save you quite a bit of hassle in the long run. Other factors related to chair design such as dead ends of tubing within the chair (aka dead legs), with no directional water flow can adversely affect your ability to sustain compliant levels of bacteria. Thankfully, modern design revisions have improved flaws like dead legs. But if you have an older chair with these flaws, I recommend consulting with your trusted dental equipment technician for possible solutions. Source water quality is a subject we’ve been emphasizing for some time now and this post will be no exception. It can make or break your treatment program, and if not properly accounted for when choosing a treatment option, it can render the entire protocol a wasted effort. Typically, if a practice is willing, we attempt to push folks towards using distilled quality water. Its consistent purity is indicative of a coolant medium suitable for a medical environment such as a dental operatory. Treatments that rely on trace or residual amounts of chemicals for both safety and long-term treatment efficacy will maintain more consistent results when using distilled water. This is not my opinion, it’s chemistry. If a practice intends to use its municipal tap water, some level of water quality assessment should be taken to ensure municipal contaminants and additives are not present in concentrations that would adversely affect treatment outcomes. Tap water, while preferred for convenience and low cost, is not suitable in most cases for a medical environment like a dental operatory. If you haven’t already, check out our blog post, Municipal Tap Water: Use with Caution, for a list of good reasons to consider distilled. For most Sterisil® customers, a simple total dissolved solids (TDS) test is enough to know if their tap water is a suitable host for treatment. Regardless, as a general guideline, water with TDS levels exceeding 250ppm is not suitable for reliable and consistent treatment with most Sterisil products. If your tap water has greater than 250ppm TDS, there are methods for improving that water quality. I recommend you speak with one of our Dental Water Compliance Specialists, or call our customer support team for advice in this area. There are more in-depth water quality assessments aside from a simple TDS hand test, and I would advise folks to go with what they can afford. Consult with your treatment and chair manufacturers about what they recommend with their products. There is no sense in jamming square pegs into round holes. If your tap water is dirty, clean it up--or don’t use it. Thank you for reading Strategies for Implementing Dental Waterline Treatment for the First Time: Part 1. To read Part 2, you will need to subscribe to this blog. As a blog subscriber, you will be the first to know when new content is published. We will never spam your email or share your information with other entities. We appreciate your continued support. If you like what we’re doing, please share this content on the socials.